Sunter Tower Fan Review (Indepth & Un-Biased) Yay or Nay? Tower fans are a great way to help cool yourself or your home but with so many options available, how does the Sunter Tower Fan stack up compared to others? We would say – ok. There is nothing overly unique or spectacular about this fan and perhaps lacks a little quality, however, it’s airflow is quite good. Read on to find out the pros and cons in our in-depth, unbiased Sunter Tower Fan review and check out the fan in the youtube video below. The Sunter tower fan has a style not that too dissimilar to the popular Seville classics and is actually the same size at 40 inches tall. It has an all-black style and is made from plastic, much like most other tower fans. The controls are at the top of the fan and all these controls can also be controlled by the remote control for extra convenience. The buttons make a noise when you press them which can be an issue for some people. For example, those that are sleeping at night and want to make a change to the settings quietly will get a loud beep which could perhaps wake others up. It’s casing on the front has grooves running vertically and in this case, these are not able to be moved for extra control of the fan. Safety is always a concern for consumers and they can feel safe in the fact this fan comes with a safety fuse technology. To reaffirm that safety factor the Sunter fan is also ETL listed which means it has passed independent North American safety standards. The fan is reported by a number of consumers to be very stable at the base. This can be an issue with some tower fans. Sometimes when they oscillate it can cause the unit to wobble, or move around. At 40 inches, it should be high enough to reach over most beds to give you a cool breeze when you are going to sleep. Luckily it doesn’t seem to be the case here. As far as airflow goes it is positive in that there have not been many consumers complaining about the lack of airflow. It seems this unit has pretty good airflow but perhaps at the cost of noise. Most standard tower fans these days come with a minimum of three speeds but the Sunter Tower Fan goes one extra with 4 speeds. Econ, low, medium and high are the speeds the fan contains. Other fans such as the Dyson Am07 have a few more wind speeds options (10) while on occasion one might have a variable speed setting. This fan also has 3 wind modes. This setting is your standard wind mode. Wind will flow at the same level until you turn the fan of or change the setting. This mode attempts to recreate a natural ‘breeze’ you might find outdoors. It does this by choosing speeds at random for 80 seconds. If you have High speed selected, then this will be the most common mode chosen. This mode will cycle down through the wind speeds to the lowest setting (ECON). For example, if you start on ‘high-speed evening wind’, each half hour the speed setting will drop down one setting, so to medium, then low, then to ECON. This setting is ideal for those about to go to sleep, with the strongest setting while you are in the process of going to sleep. Like any decent modern day fan, the Sunter Tower Fan has the oscillation feature which enables you to spread the airflow around the room rather than just in the one direction. Consumers have noted that the fan has about a 1/4 turn oscillation which is average-below average for most tower fans. 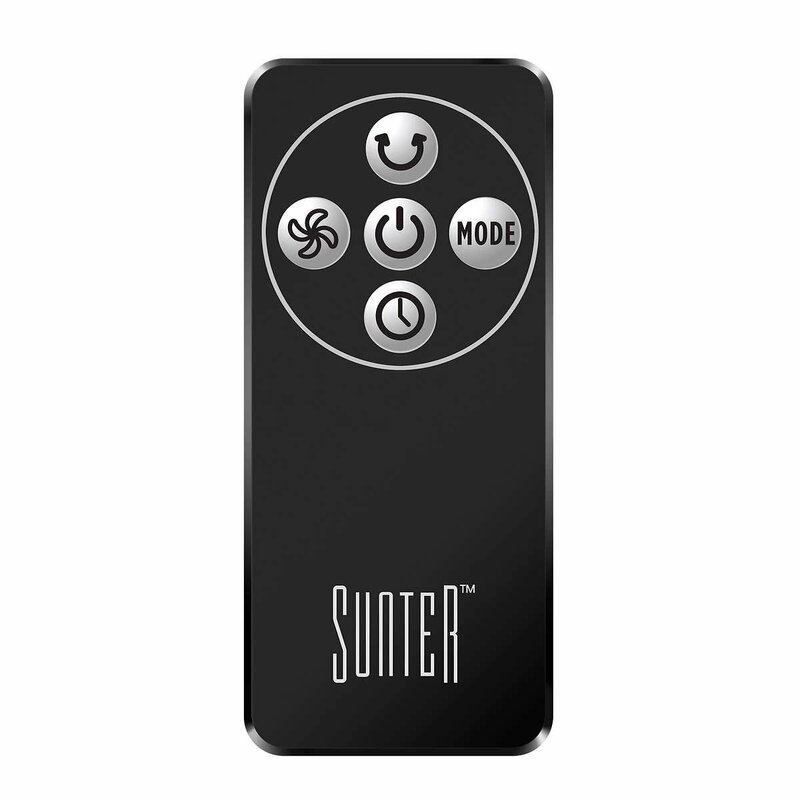 The timer on the Suntor Tower Fan has the ability to be input up to 15 hours. It has settings of 1, 2, 4, 8 hours and can be programmed for any number of hours up to 15 at 1-hour increments. It’s also a great tool for being energy efficient given you don’t need to keep the fan running constantly. It’s remote control on the Sunter fan has the ability to control all the functions on the tower fan, which is great for your convenience. The remote control itself is quite small, and the buttons are somewhat flat. The remote control is controlled by a “DL2032” coin cell battery. While the marketing claims the fan to be ‘ultra-quiet’ many consumers found that this was not exactly the case. This is not uncommon for tower fans, however. Often the more powerful the fan, the more noise it makes. Cleaning instructions from Sunter state not to open the fan in order to clean it. The recommendation is to clean the fan only with a soft cloth and to NOT ever use water or other cleaning liquids. Other soften used compressed air in order to comprehensively clean out the fan, however, it is not the recommended method by the manufacturer. You won’t need to buy filters for the fan. This fan runs on 54W and for safety has an overload protection feature for added safety. There is nothing particularly unique about this particular fan. While it might have more features than some other tower fans, such as the breeze modes, there are other fans which carry the same features as the Sunter, such as the Seville Classics which also comes in a solo package and at a cheaper price. The assembly of this fan still seems to be relatively simple though it is of note that a few consumers mentioned they needed a couple of people to put the fan together. Compared to other fans, it was also mentioned that it is a little more difficult to put together than other tower fans. You can see the assembly process in Sunter tower fan Manual here. Depending on where you buy this fan you may find that the large tower fan comes in a combo package with a smaller, desktop fan. This may not be ideal for some as it seems to make the price just that little bit more than your average tower fan. The Sunter Tower is a bit of a mixed bag when it comes to customer feedback. Some had mechanical difficulties with various things, but when the large tower fan was working then people seemed to be reasonably happy with the fans features and output. The Sunter Tower Fan like most other tower fans comes with a one year warranty. The Sunter Tower Fan in most places comes as a combo with a smaller, desktop, tower fan so, depending on where you purchase this fan, this puts the price up a little bit more and makes it just that little bit more pricey than your average tower fan. Some local stores may have a cheaper deal. If you are wanting some alternatives to the Sunter Tower Fan, we would recommend looking at the Seville Classics fan which is almost exactly the same model with a more proven track record, or the Soleus Tower Fan which has the highest ratings for any tower fan on Amazon. Or check out our guide to the best tower fan. The Sunter Tower Fan looks to be a solid but unspectacular unit.It has most features other tower fans have such as various breeze modes, a remote control, 4 speeds, and oscillation, with nothing really unique about it.It is a very similar unit to the popular Seville Classics but is perhaps burdened by the fact it contains a smaller fan in a combo package.This seems to increase the price where you can get the Seville (depending on where you shop) for a lower price.Like other tower fans, cheap materials and low selling price sometimes mean the quality of build is not what you would ideally want.But for the most part, when the fan works ok, people had few complaints about the airflow of the fan.It may not be the quietest fan, but should be sufficient in regards to airflow if you don't mind a little noise. They should use oilite bearings with cotton oil wick. I have four fans and both tall fans need oil . I have taken one apart and lubed one of them. They could run an oil tube to the outside of housing. I purchased about a year ago and all was working fine until yesterday. The buttons on the remote all just turn the fan on and off except the on and off button. The on and off button doesn’t work at all. The fan does operate but in order to change the speed, oscillate, change mode or set the timer has to be done on the unit. The fan is in my home office and the reason to purchase this one was for the remote feature. I would assume that it is now out of warranty? – you could either take the remote apart and have a play around or your best bet, if the fan still works, is contact Sunter directly and order a new remote, if their customer service is good they (may) send you a new one free, but again if the fan works, a new remote is still likely to be cheaper than a new fan. Interesting reading, my Sunter Tower was bought last July so yup, good for a year! The fan worked fine until shortly after it’s one year warranty expired. The fuse located in the power cord plug died and I discovered that replacing it without spending far too much money was impossible. I contacted manufacturer requesting source to obtain replacement fuses 3 times & received no response to my inquiries. I would expect at the price this fan should last a minimum of 3 years.